The physiological approach suggests that an environment associating mesenchymal stromal cells with low O2 concentration would be most favorable for the maintenance of hematopoietic stem/progenitor cells (HSPCs). To test this hypothesis, we performed a coculture of cord blood CD34+ cells with Wharton’s jelly mesenchymal stem cells (WJ-MSCs) under different O2 concentration to simulate the growth of HSPCs in vivo, and assessed the impacts on stemness maintenance and proliferation of cord blood HSPCs in vitro. CD34+ cells derived from cord blood were isolated and cocultured under 1%, 3%, or 20% O2 concentrations with irradiated WJ-MSCs without adding exogenous cytokines for 7 days. The cultured cells were harvested and analyzed for phenotype and functionality, including total nuclear cells (TNC), CD34+Lin− cells, colony forming unit (CFU) for committed progenitors, and long-term culture initiating cells (LTC-ICs) for HSPCs. The cytokine levels in the medium were detected with Luminex liquid chips, and the mRNA expression of hypoxia inducible factor (HIF) genes and stem cell signal pathway (Notch, Hedgehog, and Wnt/β-catenin) downstream genes in cord blood HSPCs were confirmed by quantitative real-time polymerase chain reaction (qRT-PCR). Our results showed that the number of TNC cells, CD34+Lin− cells, and CFU were higher or similar with 20% O2 (normoxia) in coculture and compared with 1% O2 (hypoxia). Interestingly, a 1% O2 concentration ensured better percentages of CD34+Lin− cells and LTC-IC cells. The hypoxia tension (1% O2) significantly increased vascular endothelial growth factor (VEGF) secretion and decreased interleukin (IL)-6, IL-7, stem cell factor (SCF), and thrombopoietin (TPO) secretion of WJ-MSCs, and selectively activated the Notch, Wnt/β-catenin, and Hedgehog signaling pathway of cord blood HSPCs by HIF-related factors, which may play an important role in stemness preservation and for sustaining HSPC quiescence. Our data demonstrate that cord blood HSPCs maintain stemness better under hypoxia than normoxia with WJ-MSC coculture, partially due to the increased secretion of VEGF, decreased secretion of IL-6 by WJ-MSCs, and selective activation of stem cell signal pathways in HSPCs. This suggests that the oxygenation may not only be a physiological regulatory factor but also a cell engineering tool in HSPC research, and this may have important translational and clinical implications. Umbilical cord blood (UCB) is an alternative source of hematopoietic stem/progenitor cells (HSPCs) for transplantation in malignant and nonmalignant hematologic diseases. However, since the amount of HSPCs in a single unit of cord blood is insufficient for transplantation in most adult patients, the application of cord blood HSPCs remains with a major limitation . The ex-vivo expansion of cord blood HSPCs is one feasible method to increase the HSPC number and has recently become a focus for research. HSPCs maintain their stemness by interacting with stromal cells and the extracellular matrix through cell-to-cell contact and paracrine factor secretion . The microenvironment of the placenta or umbilical cord, where the UCB-HSPCs reside in, is different to that in bone marrow, with the stromal cells including Wharton’s jelly mesenchymal stem cells (WJ-MSCs) and vascular endothelial cells being dissimilar to bone marrow stromal cells (e.g., no osteoblasts). Compared with MSCs from the bone marrow, WJ-MSCs not only express cell markers of BM-MSCs, but also additionally express many molecules involved in HSPC expansion and interaction, such as granulocyte colony stimulating factor (G-CSF), granulocyte macrophage colony stimulating factor (GM-CSF), and CD117 . These advantages make WJ-MSCs a preferable feeder layer choice for UCB-HSPC expansion in vitro. Furthermore, in physiological situations, HSPCs are distributed in the tissues with low oxygen tension, and it is now widely accepted that gradients of oxygen from below 1% in hypoxic niches to 6% in the sinusoidal cavity exist within the human bone marrow [4, 5]. Like all other established cell lines, stem cells were typically cultured under ambient oxygen tension with very little attention paid to the metabolic milieu of the niche in which they were grown or normally resided. In this study, we compared the effects of combining WJ-MSCs at different O2 concentrations in coculture on stemness maintenance and proliferation of HSPCs in vitro without adding exogenous cytokines. Our results show that stemness of HPSCs can be better maintained at 1% O2 with WJ-MSC coculture. Under hypoxia, the levels of secretion of different cytokines via WJ-MSCs and selective activation of stem cell signal pathways may impact a few mechanisms. Umbilical cord samples were collected from healthy full-term deliveries after obtaining informed consent as a donation for research. The preparation of the umbilical cord tissue was completed within 12 h. The umbilical cord sample was rinsed with normal saline to remove the residual blood. It was then cut into 1.0-cm long segments, and each segment was cut into a 1.0 mm3 tissue mass and evenly plated in a 10.0-cm dish. The dishes were incubated at 37 °C under 5% CO2 for 24 h, and then 10 ml culture medium contained 45% low-glucose Dulbecco’s modified Eagle’s medium (DMEM), 45% Ham’s F-12, and 10% fetal bovine serum (FBS) (Life Technologies, Grand Island, NY, USA) was added. Half of the medium was replaced 7 days later, and then half of the medium was replaced every 3 days until the primary cells reached subconfluence. The primary cells were detached with trypsin-EDTA (0.25%) (HyClone Laboratories, Logan, Utah, USA) and the reaction was terminated with FBS to passage. Cells harvested from every three dishes were plated in a T-75 flask, and daughter cells were passaged at 1:4 ratios in T-75 flasks. The phenotypic characterization on second- to fourth-passage WJ-MSCs was assayed using a FACScan flow cytometer (Beckman Coulter, USA) for CD90-FITC, CD45-PECY7 (eBioscience, San Diego, CA, USA), CD105-PE, HLA-DR-PECY5, CD34-PE, and CD166-PE (Biolegend, San Diego, CA, USA) according to the manufacturer’s instructions. Appropriate isotype controls for nonspecific binding were set for each antibody. For each sample, the assayed cells were analyzed for at least 10,000 events. 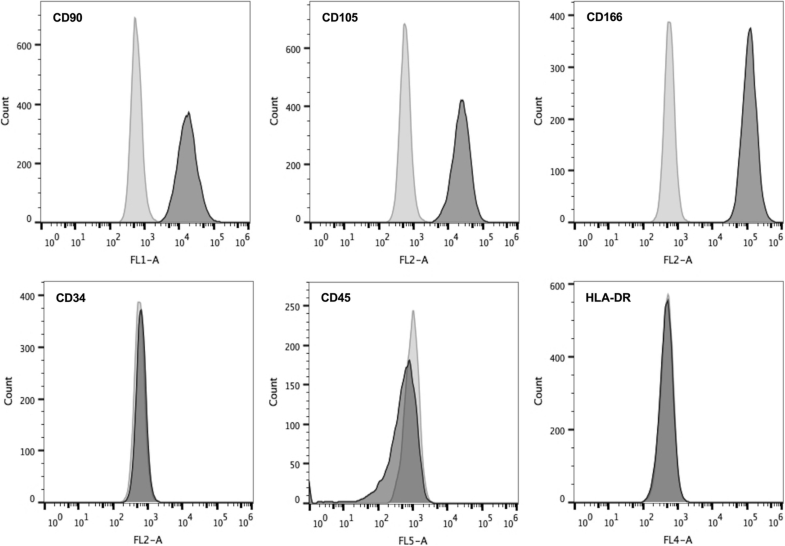 The WJ-MSCs expressed CD90, CD105, and CD166, and were negative for CD45, CD34, and HLA-DR (Fig. 1). Umbilical cord blood was collected from normal full-term delivery after obtaining informed consent from the mothers as a donation for banking, and only cord blood samples not appropriate for banking (< 100 ml) were used in our experiments. We mixed cord blood with 6% hetastarch in 0.9% sodium chloride (Hospira, USA) at a ratio of 4:1 and let it stand for approximately 30 min to allow most of the red cells to form a sediment. Cells in the supernatant was laid onto Ficoll-Paque PLUS (GE Healthcare Bio-Sciences, Pittsburgh, USA) and centrifuged to collect mononuclear cells (MNCs) by depleting the platelets, plasma, and residual red cells. Enrichment of CD34+ cells was performed with two runs of immunomagnetic selection on MiniMACS columns (Miltenyi Biotec, Gladbach, Germany) in accordance with the manufacturer’s instructions. WJ-MSCs at passages 2 to 4 were harvested and radiated (25 Gy) to prevent overgrowth. We then plated them into 12-well plates (8 × 104/well) with H5100 medium contained 10−6 M hydrocortisone (StemCell Technologies, Vancouver, BC, Canada). At least 24 h later, we removed the medium and seeded purified CD34+ cells (suspended in H5100 medium with 10−6 M hydrocortisone) into the plate (4 × 104/well). WJ-MSCs and CD34+ cells were cocultured at 37 °C and 5% CO2 under normoxic (20% O2) and hypoxic (3% and 1% O2) conditions for 7 days without adding exogenous cytokines, replacing half of the medium every 3 days. Hypoxic cultures were made in a two-gas incubator (Thermo Scientific, Forma™ Steri-Cycle i160 STERI-cycle, USA) equipped with an O2 probe to regulate N2 levels. We also set a control group without WJ-MSCs as feeder layers, with the medium and culture conditions as described above. We defined the CD34+, CD10−, CD14−, and CD19− cells as CD34+Linage− (CD34+Lin−) cells, which represent cord blood HSPCs. At day 7, we collected the supernatant and detached the adherent cells containing WJ-MSCs and HSPCs (attached to the WJ-MSCs). Viable total nucleated cells (TNC) were counted via the Trypan Blue staining method. 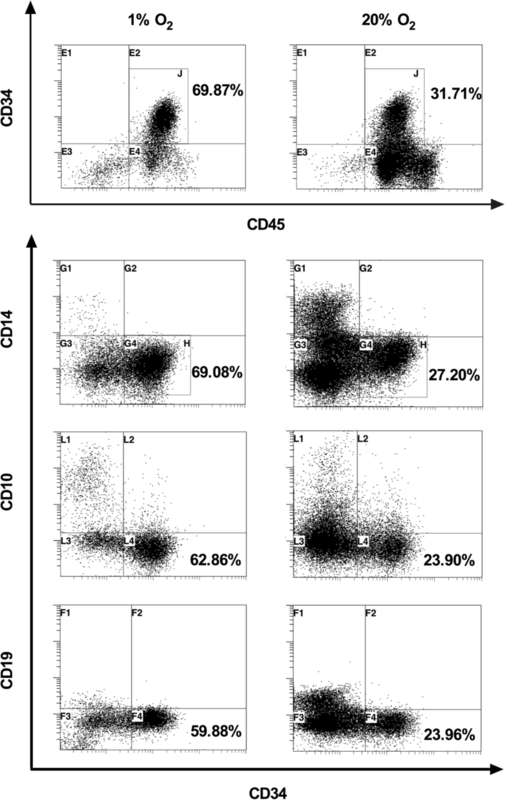 Flow cytometry staining was performed with CD34-PECY7, CD45-FITC (eBioscience, San Diego, CA, USA), CD10-APC, CD14-APC/Cy7, and CD19-PE (Biolegend, San Diego, CA, USA) antibodies, and then samples were analyzed using a FACScan flow cytometer (Beckman Coulter, USA). For each sample, at least 30,000 events were recorded. The isotype antibodies were used to determine the level of nonspecific binding. On day 7, the harvested cells from each group were plated in semisolid culture (H4434, Stem Cell Technologies, Vancouver, BC, Canada) following the manufacturer’s instructions for the colony-forming unit (CFU) assay. After incubation at 37 °C under 5% CO2 at 100% humidity for 14 days, the total colony-forming unit (T-CFU), burst-forming unit-erythroid (BFU-E), and colony-forming unit-granulocyte/macrophage (CFU-GM) levels were scored under an inverted microscope. Each CFU is equivalent to a colony-forming cell (CFC). M2-10B4 (ATCC), a murine fibroblast cell line, was used as a feeder layer. At least 24 h before assay, M2-10B4 cells were radiated (80 Gy) and plated in six-well plates (2.5 × 105/well). The plates were coated with collagen solution (StemCell Technologies, Vancouver, BC, Canada). Cells harvested from coculture systems at different oxygen concentrations on day 7 were resuspended with H5100 containing 10−6 M hydrocortisone (StemCell Technologies, Vancouver, BC, Canada) and then seeded into the plate (2 × 105/well) with the feeder layers. At weekly intervals we replaced half of the medium. Both nonadherent and adherent cells were harvested at week 5 and plated in semisolid culture (H4434, StemCell Technologies, Vancouver, BC, Canada) for CFC assay. After 18 days, colonies were scored under an inverted microscope. The long-term culture-initiating cell (LTC-IC) number was calculated according to the manufacturer’s instructions. WJ-MSCs were radiated (25 Gy) and plated into 12-well plates (8 × 104/well) suspended with H5100 medium containing 10−6 M hydrocortisone (StemCell Technologies, Vancouver, BC, Canada). Twenty-four hours later, we replaced the medium and cultured the WJ-MSCs at 20% O2 or 1% O2, replacing half of the medium twice a week. On day 7, we collected the supernatant of the medium and analyzed the concentration of the following cytokines in each group by Luminex assays Kit (R&D Systems, USA) on Luminex 200: tumor necrosis factor (TNF)-alpha, interleukin (IL)-6, IL-3, vascular endothelial growth factor (VEGF), stem cell factor (SCF), IL-7, GM-CSF, macrophage colony stimulating factor (M-CSF), G-CSF, and thrombopoietin (TPO). H5100 culture medium with 10−6 M hydrocortisone incubated under the same conditions for each group was set as a blank control. We harvested the nonadherent cells of each coculture system on day 7. Total RNA was isolated using the MicroElute Total RNA Kit (OMEGA Bio-tek, Norcross, Georgia). Single-strand cDNA was synthesized using the HiFiScript cDNA Synthesis Kit (CW-Bio, Jiangsu, China). Quantitative real-time polymerase chain reaction (qRT-PCR) was performed using the SYBR Green PCR Master Mix (Fermentas, Vilnius, Lithuania) on a CFX96 Touch™ Real-Time PCR Detection System (Bio-Rad). The housekeeping gene β-actin was used as a reference gene. Detected genes included: the hypoxia inducible genes HIF1-α, HIF2-α, and ARNT; the Notch pathway downstream genes HES1, HES3, HEY1, and HEY2; the Wnt/β-catenin downstream genes AXIN2, MMP7, and TCF-1; and the Hedgehog downstream genes GLI1, PTCH1, PTCH2, and SMO. Gene-specific primer sets are listed in Table 1. The statistical differences between each group were analyzed using the SPSS 20.0 statistical software for all the experiment data. The comparison was analyzed between two groups with an independent sample t test, and among three groups with single-factor analysis of variance (ANOVA). The values were plotted as mean ± standard deviation. Probability values P < 0.05 were considered statistically significant. In this study, we defined CD34+CD10−CD14−CD19− phenotypic cells as the CD34+lin− HSPC cells (Fig. 2). First, we compared the effects of 3% O2 with 20% O2 on the WJ-MSC-HSPC coculture in vitro for 7 days. The results showed that there was no significant difference between these two groups in the percentage or cell numbers of CD34+Lin− cells, as well as the number of TNC (P > 0.05). We then cocultured UCB-HSPCs with WJ-MSCs at 1% O2 and 20% O2 concentrations. We collected cells on day 7, and the TNC counts at 1% O2 and 20% O2 were 3.68 ± 1.97 × 104 and 13.50 ± 5.04 × 104 (P < 0.05), respectively; the number of CD34+Lin− cells was 2.70 ± 1.07 × 104 and 3.82 ± 1.28 × 104 (P > 0.05), respectively; and the percentage of CD34+Lin− cells was 76.83 ± 10.56% and 29.05 ± 7.74% (P < 0.01), respectively. As a control, compared with the coculture group under 1% O2 conditions, the number of TNC and CD34+Lin− cell in the suspension culture group was 1.06 ± 0.10 × 104 and 0.57 ± 0.06 × 104, respectively, and the percentage of CD34+Lin− was 53.87 ± 5.02% (P < 0.05) (Fig. 3). The TNCs were harvested on day 7 from the 1% O2 and 20% O2 culture systems for CFU and LTC-IC assay. Methylcellulose colony-forming assay was performed to evaluate the differentiation potential (CFU), and the LTC-IC was evaluated for the maintenance capacity of HSPCs in vitro (Fig. 4). Among the TNCs harvested per well, the 1% O2 group induced 38,542 ± 24,647 T-CFUs and 31,846 ± 20,165 CFU-GMs, and the 20% O2 group induced 80,331 ± 6079 T-CFUs and 59,013 ± 6283 CFU-GMs (P > 0.05). The BFU-E results for the 1% O2 and 20% O2 group were 6697 ± 4548 and 21,317 ± 2424 (P < 0.05) (Fig. 4a). The number of LTC-IC from the 1% O2 and 20% O2 groups were 298 ± 45 and 244 ± 89, respectively (P > 0.05). In each 10,000 TNCs, the LTC-IC amounts for the 1% O2 and 20% O2 groups were 126 ± 37 and 12 ± 4, respectively, which indicated that hypoxia culture could maintain LTC-IC count capacity better than normoxia culture (P < 0.05). To explore the cytokine levels secreted by WJ-MSCs at different oxygen concentration, WJ-MSCs were cultured for 7 days under conditions of 1% O2 and 20% O2 and the medium was collected and the cytokines measured by Luminex liquid-phase chip. We assayed 10 cytokines related to hematopoiesis: TNF-alpha, IL-6, IL-3, VEGF, SCF, IL-7, GM-CSF, M-CSF, G-CSF, and TPO. The results show that the culture medium contained much higher levels of VEGF in the 1% O2 group than the 20% O2 group (P < 0.01), and more IL-6, IL-7, SCF, and TPO in the 20% O2 group than in the 1% O2 group (P < 0.05) (Table 2 and Fig. 5). To investigate whether stem cell pathways were activated under hypoxic conditions, we analyzed the mRNA expression levels of the suspended cells for three important stem cell activation pathways (Notch, Wnt/β-catenin, and Hedgehog) downstream genes and hypoxia inducible genes (HIF1, HIF2, and ARNT). Higher mRNA expressions were observed in HIF1, HIF2, and ARNT genes in the 1% O2 group than in the 20% O2 group (Fig. 6). Furthermore, some downstream gene expression upregulation was seen: HES1 on the Notch pathway; MMP7 on the Wnt/β-catenin downstream; and PTCH1 and SMO on the Hedgehog pathway (P < 0.05) (Fig. 6). However, for other genes such as HES3, HES5, HEY1, HEY2, TCF-1, Gli1, and PTCH2 after qRT-PCR 50 cycles, the fluorescence amplification curves of cDNA did not reach the plateau stage. This indicates that these genes were not activated in the hematopoietic cells in our low O2 coculture system. The physiological approach suggests that a microenvironment associating MSCs with a low O2 concentration would be most favorable for the maintenance of HSPCs in the course of ex-vivo expansion. The microenvironment of UCB-HSPCs in placenta or the umbilical cord is different from that in the bone marrow, and the stromal cells are dissimilar to those in bone marrow being composed of other stromal cells including WJ-MSCs and vascular endothelial cells. The microenvironment of bone marrow or cord blood is extremely hypoxic compared with ambient air . The physiological low O2 concentrations protect the primitive hematopoietic cells against oxidative stress in vivo. Although some studies suggest that 3% O2 culture conditions could maintain the stemness of UCB-HSPCs better than 20% O2 [7, 8], our study showed some different results which might be due to our coculture system using WJ-MSCs as feeder layers and without the addition of exogenous cytokines. Furthermore, we compared a lower oxygen concentration (1%) with 20% O2; the results showed that, although the number of CD34+Lin− cells was lower at 1% O2 than at 20% O2, the percentage of CD34+Lin− cells was significant higher at 1% O2. Similar trends were also observed for T-CFU, CFU-GM, BFU-E, and LTC-IC in the 1% O2 and 20% O2 groups, and the LTC-IC number per 10,000 TNCs in the 1% O2 group was significant higher than the 20% O2 group, indicating that a hypoxia culture could preserve the functional capacity to maintain LTC-IC counts better than a normoxia culture. Eliasson et al. cultured mouse bone marrow HSPCs at 1% O2 and 20% O2 in suspension and found that a 1% O2 culture system could better maintain the stemness of HSPCs . These results confirmed the major role of the microenvironment for stromal cells and low O2 concentrations for stem cell maintenance. The mechanisms of how low O2 can maintain the stemness of HSPCs is still obscure. Some publications have already evaluated the effects of hypoxia on UCB-HSPCs. The reduction in cell division kinetics and a higher percentage of G0 cells in hypoxic O2 compared with 20% O2 conditions have been reported [6, 10]. Low O2 tension increases the expression of hypoxia-inducible factor (HIF)-1 which mediates an active switch from oxidative to glycolytic metabolism, limiting reactive oxygen species (ROS) production and promoting its degradation. ROS terminates the quiescent state of HSPCs and promotes their differentiation . Recently, Mantel et al. reported that, in ambient air, HSPCs were compromised through the activation of the mitochondrial permeability transition pore; this process can be inhibited by setting a hypoxia condition during harvesting and transplantation of donor bone marrow or by using cyclosporin A, which can protect HSPCs from extraphysiologic oxygen shock/stress (EPHOSS) . The mechanisms behind MSC hematopoiesis support are still elusive, whether cell-to-cell direct contact and/or soluble factor secretion [13, 14]. Proteomic analysis of the WJ-MSCs revealed high levels of interleukins (IL-1a, IL-6, IL-7, IL-8), as well as SCF, hepatocyte growth factor (HGF), and ICAM-1, suggesting once again that they may be the agents involved in the expansion of UCB-HPSCs . To investigate the combination roles of WJ-MSCs with low O2, we assayed 10 cytokines involved in hematopoiesis: TNF-alpha, IL-6, IL-3, VEGF, SCF, IL-7, GM-CSF, M-CSF, G-CSF, and TPO in the supernatant of WJ-MSC coculture medium at 1% and 20% O2. The results show that the culture medium contained much higher VEGF levels in the 1% O2 group, and higher levels of IL-6, IL-7, SCF, and TPO in the 20% O2 group. It is surprising that VEGF level was so high in our coculture system at 1% O2, and this indicates that the hypoxic response of WJ-MSCs is characterized by a rapid increase in VEGF secretion and glycolytic activity. This rapid increase in VEGF secretion may play a critical role in the survival and expansion of human UCB-HPSCs under hypoxia. VEGF is a principal regulator of hematopoiesis, which provides for quiescence and self-renewal as well as restraining the differentiation of HSPCs [16, 17]. This may explain the reason why the TNCs harvested at 1% O2 contained more long-term reconstruction cells and less lineage-committed progenitor cells. The function of IL-6 and IL-7 is to induce the differentiation of HSPCs [18, 19], and our results showed that the levels of IL-6 and IL-7 were significantly higher at 20% O2. This may indicate a differentiation role under normoxia stimulation. Other cytokines, such as TNF-α, IL-3, M-CSF, and G-CSF which promote differentiation [20, 21], tended to decrease at 1% O2. This may contribute to maintaining the stemness of HSPCs. In a recent research, Paquet et al. 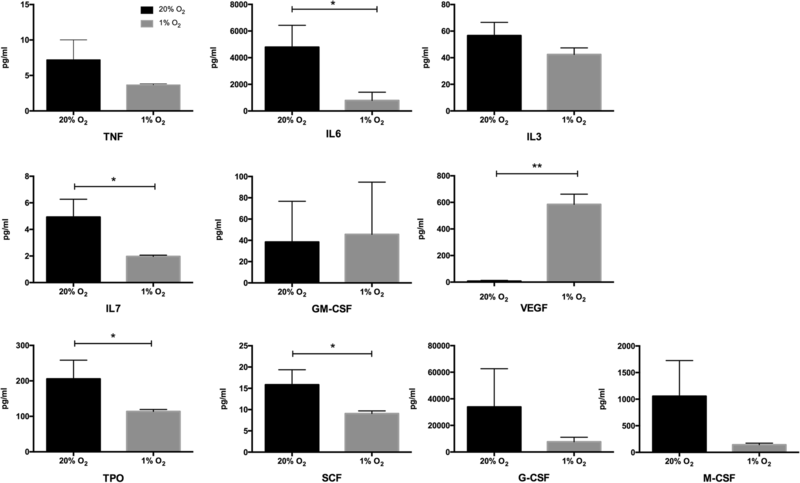 cultured human bone marrow MSCs at different oxygen concentration (21%, 5%, and 0.1%), and showed that hypoxic conditions increased the MSC paracrine secretion of angiogenic mediators such as VEGF, IL-8, RANTES, and monocyte chemoattractant protein 1, and significantly decreased the expression of several inflammatory/immunomodulatory mediators, such as IL-6, IL-15, and IL-1Rap . Majumdar et al. compared the effects of normoxia (20% O2) with hypoxia (2% O2) on the paracrine secretion of WJ-MSCs; their results showed there was significantly increased secretion of VEGF and HGF under hypoxia . These studies are consistent with our findings. Taken together, MSCs exposed to a hypoxic culture increase the expression of VEGF, promote the phosphorylation of focal adhesion kinase , and increase the expression of chemokine receptors such as CXCR4 and CX3CR1 . To investigate whether stem cell pathways were activated under hypoxic condition, we analyzed the mRNA expression levels of the harvested HSPCs on hypoxia-related genes (HIF1, HIF2, and ARNT) and Notch, Wnt/β-catenin, and Hedgehog pathway downstream genes. Our findings showed that 1% O2 induced higher mRNA expressions of HIF1, HIF2, and ARNT genes, and upregulated some downstream gene expression, such as HES1 on the Notch pathway, MMP7 on the Wnt/β-catenin downstream, and PTCH1 and SMO on the Hedgehog pathway. Hypoxic tension promotes the expression of the hypoxia inducible factor-related genes HIF-1α, HIF-2α, and ARNT. These genes encode HIF-α subunits that are stabilized under low oxygen tensions and exhibit tissue-restricted expression. Upon stabilization, these subunits dimerize with the β-subunit, HIF-β (ARNT), and translocate to the nucleus to regulate a spectrum of genes to maintain oxygen homeostasis, glucose metabolism, angiogenesis, erythropoiesis, and iron metabolism . Hypoxia has been shown to activate molecular pathways in multiple stem cell systems. Notch signaling is widely appreciated to be critical for the maintenance of undifferentiated stem and progenitor cell populations. Ezashi et al. found that oxygen tensions as low as 1% appeared to decrease proliferation and maintain pluripotency of stem cells, while higher oxygen tensions (3–5%) appeared to maintain pluripotency with no effect on proliferation . Our experiments showed that the activation of the three important signal pathways in HSPCs under hypoxia was significantly enhanced. However, the downstream genes of the three pathways were selectively activated and, thus far, their functions are not able to be shown. Some researchers have tried to confirm a correlation between HIF-related genes and stem cell pathways under hypoxia. Mukherjee et al. reported that, in drosophila blood cells, HIF-α binds to the Notch ligand intracellular segment to promote Notch downstream gene expression . Bijlsma et al. found that HIF1-α induced hedgehog pathways activated by PTCH1 in the mouse . Mazumdar et al. verified the relationship between HIF1 and TCF-1 in mouse embryonic stem cells , and Liu et al. confirmed the relationship between HIF1-α and MMP7 protein content in gastric cancer cell lines . The increased expression of HIF-related factors, HES1, PTCH1, and MMP7 under hypoxia in our study can partially explain the positive effect of a hypoxic coculture system on stemness maintenance of UCB-HSPCs, but how the stem cell pathways are activated remains to be further explored. In this study, we used WJ-MSCs as a feeder layer under low O2 tension to simulate the physiological microenvironment in which UCB-HSPCs reside to explore the effects of the coculture system on stemness maintenance and proliferation of HSPCs in vitro without adding exogenous cytokines. The results showed that the populations of CD34+Lin− cells and LTC-ICs could be preserved better at 1% O2 than at 20% O2. Hypoxia increased VEGF secretion and decreased IL-6 secretion and selectively activated the Notch/Wnt/Hedgehog signaling pathway in UCB-HSPCs via HIF-related factors, which plays an important role in preserving stemness and sustaining HSPC quiescence. However, our findings are only a starting point for pursuing optimizing protocols aimed at expanding UCB-HSPCs ex vivo, such as adding some key cytokines and growth factors, using optimal low O2 tension to protect HSPCs from EPHOSS to preserve the capacity of stemness of HSPCs, and developing bioreactor systems for in-vitro cultures, which may have important translational and clinical implications. The authors would like to thank all of the mothers who donated the umbilical cord and cord blood samples for cord blood stem cell banking and for this study. This work was supported by a grant from National Natural Science Foundation of People’s Republic of China (no. 81370595). This work was supported by a grant from the National Natural Science Foundation of People’s Republic of China (no. 81370595). DZ and TL conceived and designed the study. DZ, LL, FW, QL, and QZ performed the experiments. QC, ML, WL, JH, and YZ contributed reagents/materials/analysis tools. DZ and TL analyzed the data and wrote the paper. All authors read and approved the final manuscript. According to the Declaration of Helsinki, umbilical cord and cord blood samples were collected in local hospitals from healthy full-term deliveries after obtaining informed consent for a donation for cord blood stem cell banking with the compliance of the ethical committee review board of Sichuan Cord Blood Stem Cell Bank (LL-20100310-QX-1; LL-20151029-QD-1). The ethical committee of West China Hospital of Sichuan University approved consenting procedures for the laboratory studies.